The greatest help for an aspiring devotee comes in the form of chanting God’s names, forms, pastimes, attributes and abodes. Sing in a loud voice the bhajans and keertans that glorify God. Numerous saints have composed extremely sweet devotional songs that have been set to haunting melodies. Choose the best from these songs and sing them as you like. Some people ask whether it is not just as effective to do a mental repetition of God's name as it is to chant in a loud voice. Whether you repeat God's names in your mind or repeat them loudly, it is one and the same thing. However, loud chanting will enrich you in ways that silent meditation cannot. There are four main advantages of sankeertan, i.e. loud chanting. The first advantage of chanting is that it contains a lot of matter within it. Devotional songs composed by saints such as Meera, Soordas and Tulsidas describe God's names, forms, pastimes and glories. 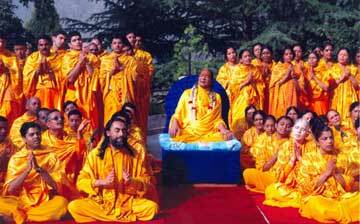 On the other hand, when you engage in mental repetition, you are more or less restricted to only the name, and that too, only one name You cannot do a mental repetition of God's pastimes, attributes and so on. Repeating the same name over and over again will lead to boredom since the mind is at present not very attached to God. You cannot experience bliss by mentally repeating only one name of Shri Krishna, and as long as you are not feeling blissful, your practice of devotion will not be considered effective. Loud chanting provides the mind with much variety. If you get bored chanting His name, you may move on to chanting His attributes. 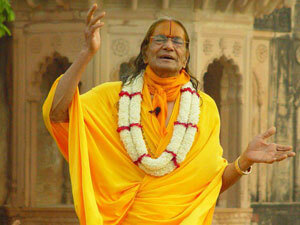 Then you can chant His pastimes, which are unlimited. There is no question of getting bored. If you get bored with one pastime, you can move on to the next. When you get bored with even that, you can think of still another. There are pastimes to suit every relationship and depict every mood of the devotee. The second advantage of loud chanting is that you are getting help from music and musical instruments. You sing God's glories, His names and pastimes. When you do jap (mental repetition) there is no music. You have the prayer beads, or just your mind. On the other hand, the word sankeertan itself denotes music. Music is pleasing to the ears. Beyond the ears is the mind that experiences happiness and sorrow. The mind likes music. Through the medium of music, you can engage the mind in the thoughts of Shri Krishna for a longer period of time. If you take the help of some musical instrument to accompany the chanting, it’s all the better for you. The third advantage of sankeertan is that when you are mentally repeating the name of God, there is no sound. Because of this silence, you will be able to hear every little sound. The clock goes tick tock-tick tock, and you will hear it. Because the mind is so wild and impetuous, it runs to the world immediately. It leaves God to go to the world. There are so many distractions around. A child starts crying and you are disturbed. Someone drops something, and the mind is again disturbed. One family member is scolding another, and you are distracted. When you do sankeertan, you're singing. You are creating a sound. Moreover, you have some sort of a musical instrument, which provides additional sound. In such a situation, the mind concentrates on God much more easily. All the senses will be involved in sankeertan, and therefore you will not even hear the other sounds. As a result, the mind will stay put and will not be as tempted to run to the world. The fourth advantage is that many people fall asleep due to the quiet atmosphere created by mental repetition. Sleep comes very easily. This does not happen in sankeertan, since you are singing with your mouth and clapping with your hands. Moreover, your ears are listening to the music, and the mind is meditating on God. In other words just about every sense-organ is involved in the chanting process. Thus, all these advantages are yours to benefit from in chanting, which are not present in mental repetition of the name. Moreover, the chanting process purifies the atmosphere, and anyone who hears the chanting benefits from it. Loud chanting is much more beneficial for us than silent repetition of God's name, especially in the beginning stages of devotional practice.